LAKEVILLE, IN. 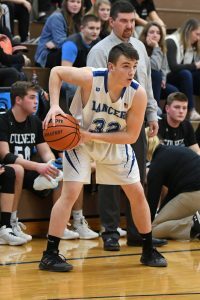 – It is a doubleheader weekend for the Class 2A #7 LaVille Basketball team. The Lancers are set to play host to Hoosier North Athletic Conference rival Triton (6-8 overall; 3-2 in HNAC) Friday. On Saturday, LaVille will travel to non-conference foe Whitko (9-8). The JV will tip at 6 p.m. both Friday and Saturday, with the varsity to follow. “Triton is a very scrappy team and are extremely well coached,” said LaVille coach Michael Edison. “They always come up with some unique defense to run against us. It might be a box-and-1, triangle-and-2, 1-3-1 half-court trap or mix in some 2-3 zone. Coach Groves always has them very well prepared to play against us. They have been playing very well lately, which is indicative of his teams as they continue to improve and get better throughout the season. They have a couple of guards that are good shooters, they crash the boards hard, and they are very feisty on defense. According to Edison, Triton freshman guard Ashton Oviedo and senior guard Beau Hepler are a pair to watch. Triton is 2-4 since January 1 and comes off a 50-26 victory against HNAC foe Caston on February 2. Whitko is 6-1 since January 1, with the lone loss coming at Peru, 69-49, on January 25. Spencer Sroufe leads the WHS offense, scoring 17 points per game and hauling in 12.5 rebounds per game. Brett Sickafoose adds 15.4 ppg and Drake Lewis 10 ppg. Whitko comes off a 73-66 victory against Central Noble. The Coaches: Jason Groves (237-95 in 14th year at Triton). Michael Edison (158-90 in 11th year at LaVille). Last Outing: Triton defeated Caston 50-26. LaVille defeated West Noble, 60-59. 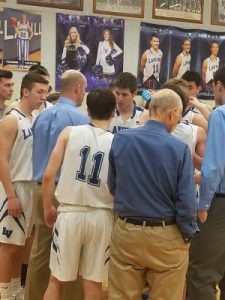 Series Last 30 Years: Triton leads LaVille, 25-9. Last Meeting: LaVille defeated Triton, 44-26, February 10 2018. Last Outing: LaVille defeated West Noble, 60-59. Whitko defeated Central Noble, 73-66.